We consider the self-deployment problem in a ring for a network of identical sensors: starting from some initial random placement in the ring, the sensors in the network must move, in a purely decentralized and distributed fashion, so to reach in finite time a state of static equilibrium in which they evenly cover the ring. A self-deployment algorithm is exact if within finite time the sensors reach a static uniform configuration: the distance between any two consecutive sensors along the ring is the same, d; the self-deployment algorithm is ε-approximate if the distance between two consecutive sensors is between d − ε and d + ε. We prove that exact self-deployment is impossible if the sensors do not share a common orientation of the ring. We then consider the problem in an oriented ring. We prove that if the sensors know the desired final distance d, then exact self-deployment is possible. Otherwise, we present another protocol based on a very simple strategy and prove that it is ε -approximate for any chosen ε> 0. 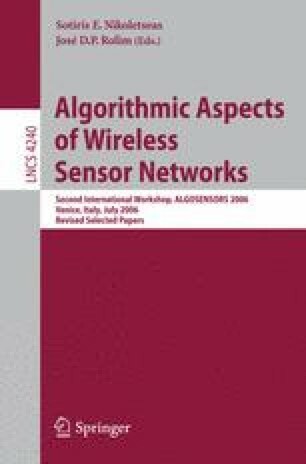 Our results show that a shared orientation of the ring is an important computational and complexity factor for a network of mobile sensors operating in a ring.